BRIGADIER GENERAL EUGENE M. POE JR. Retired September 1, 1983; died July 13, 2002. Brigadier General Eugene M. Poe Jr. was deputy chief of staff for contracting and manufacturing, Headquarters Air Force Logistics Command, Wright-Patterson Air Force Base, Ohio. He was responsible for management of a $7.2 billion contracting program in support of the command's logistic mission. Air Force Logistics Command completes more than 600,000 contracting actions yearly supporting the U.S. Air Force, as well as 62 friendly foreign air forces under the foreign military sales program. 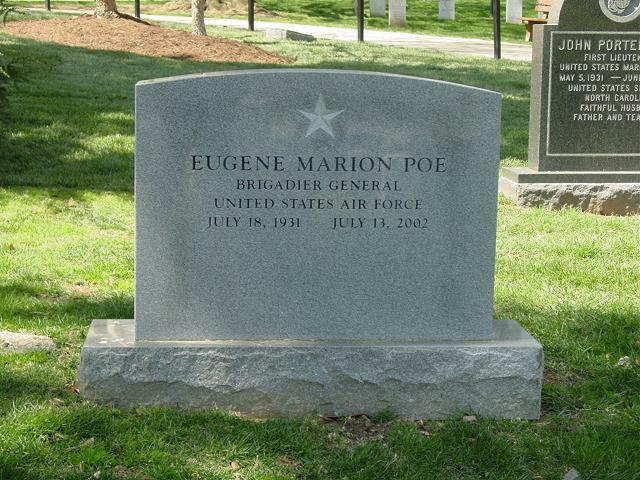 General Poe was born in 1931, in Wheeling, West Virginia., where he graduated from Linsly Military Institute in 1949. He earned a bachelor of science degree from the U.S. Naval Academy, Annapolis, Maryland, in 1954, and graduated from the University of Connecticut in 1962 with a master of business administration degree in engineering management. He completed the Air War College, Maxwell Air Force Base, Alabama, in 1972. Upon graduation from the U.S. Naval Academy, General Poe was commissioned a Second Lieutenant in the U.S. Air Force. After completing pilot training at Laredo Air Force Base, Texas, in August 1955, he spent six years at Lockbourne Air Force Base, Ohio, flying reconnaissance and electronic countermeasures missions with the 26th Strategic Reconnaissance Wing and the 301st Bombardment Wing. After receiving his master's degree from the University of Connecticut in 1962, he was assigned to the Air Force Flight Test Center at Edwards Air Force Base, California, as a flight test engineer and project officer. In June 1965 he went to the Republic of Vietnam as a forward air controller flying 0-1s from Bien Hoa and Da Nang Air Bases. project engineer on the AIM-82 missile. He later was assigned as the deputy chief engineer for the F-15. The general attended the Air War College from 1971 to 1972, and was then assigned to Hill Air Force Base, Utah, as the chief of the Systems Management Division. In January 1974 he joined the Organization of the Joint Chiefs of Staff, Washington, D.C., as chief, Systems Analysis Branch, J-4. He was assigned as chief, Allocations Division, Office of the Deputy Chief of Staff, Programs and Resources, at Air Force headquarters in May 1975. From June 1976 to August 1977, General Poe was the deputy military assistant to the secretary of the Air Force. He then became chief of the Senate Liaison Office, Office of the Secretary of the Air Force for Legislative Liaison. In July 1979 he was assigned as deputy director for legislative liaison and in August 1979 he was named deputy assistant to the secretary of Defense (legislative affairs). The general assumed his present duties in August 1981. General Poe is a command pilot with 3,500 flying hours. His military decorations and awards include the Defense Superior Service Medal, Legion of Merit, Distinguished Flying Cross with oak leaf cluster, Air Medal with 17 oak leaf clusters, Meritorious Service Medal with oak leaf cluster and Joint Service Commendation Medal. He was promoted to brigadier general June 1, 1979, with date of rank May 19, 1979. POE, EUGENE M., Brigadier General, USAF (Ret). On Saturday, July 13, 2002 at Hospice of Northern Virginia. General Poe was an aviation industry executive following his retirement from the U.S. Air Force. A graduate of the U.S. Naval Academy and Air War College, General Poe also received an MBA from the University of Connecticut. He is survived by his wife, Jane, of McLean, Virginia; two sons, Matthew, of Alexandria, Virginia and Justin, of Jacksonville, Florida and six grandchildren. Funeral services will be held at the Fort Myer Old Post Chapel on Thursday, August 8, at 1 p.m. Interment Arlington National Cemetery with Full Military Honors. In lieu of flowers, the family requests contributions to the ARCS Endowment Fund, 1104 Park Royal Ct., Great Falls, Virginia 22066.